Reverend Guitars shows at NAMM 2013 a new electric guitar called the Bayonet equiped with Railhammer pickups. The Bayonet features a new design with beveled solidbody edges and reverse headstock in a pure heavy rock style. More details available on www.reverendguitars.com. 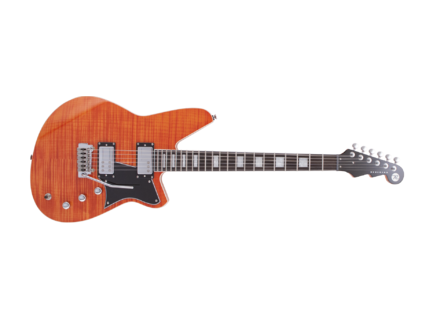 [NAMM] Reverend Stu D Baker guitar Reverend started to unveil the list of new instruments that will be introduced at NAMM, in particular the Stu D Baker semi-hollow guitar. New Reverend 15th Ann. Flatroc Finishes Reverend Guitars launched the 15th Anniversary Flatroc guitar in five new metal flake colors. New Reverend Manta Ray 290 Models Reverend’s Manta Ray 290 now has a top that comes in two new finishes.